Silk, the Kindle Fire HD’s browser, sports a nice, clean interface. Still, there are a few things you can do to personalize the way Silk looks and acts that might work better for you. With Silk open, tap the Menu button on the Options bar, and then tap Settings. 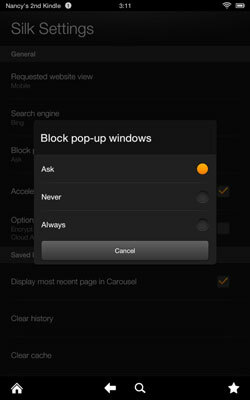 Block Pop-Up Windows: You can make settings that require Silk to ask about displaying pop-up windows, never display them, or always display them. 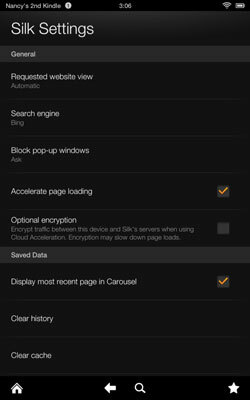 Display Most Recent Page in Carousel: Specify whether recently visited web pages are displayed in Kindle Fire’s Carousel. Remember Passwords: Saves you time entering usernames and passwords for sites you visit often. Just be aware that this setting puts your accounts at risk should you ever misplace your Kindle Fire HD. One option, if you use this setting, is to require a password to unlock your Kindle Fire HD’s Home screen. If you want to get rid of all the settings you’ve made to Silk, with Silk open, on the Options bar, tap the Menu button, and then tap Settings. Scroll down to Advanced Settings and then tap Reset All Settings to Default.